You spend most of the day at work looking at a computer. At home, you check emails, pay bills, and read books all using your laptop, smartphone, or tablet. Sound familiar? All of this technology may have an unexpected side effect, called computer vision syndrome. Computer vision syndrome is a group of symptoms involving vision problems and eye discomfort. Your eyes may feel sore, tired, and dry. You may also have blurry vision and headaches. The syndrome doesn’t cause permanent damage. The cause? Electronic media has smaller type, bright backlighting, and lower contrast, eye doctors explain. We may also blink less often when looking at digital versus print media, research suggests. 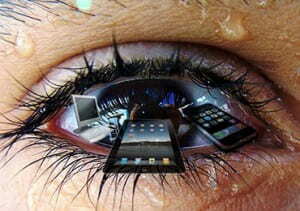 Surveys show that up to three-fourths of computer users experience eye discomfort. Assess your setup. Move your monitor back so that you are about 25 inches away from the screen. Adjust your monitor and s eat height so that you can look slightly down at the screen and place your feet flat on the floor. Be screen smart. The brightness of your screen should match the light level in the room. Use an anti-glare display when possible, and keep it clean and dust-free. And make sure there’s as much difference between the background and text as possible by adjusting the screen’s contrast. Follow the 20-20-20 rule. Shift your vision to a spot 20 feet away for at least 20 seconds every 20 minutes. Give your eyes some R and R. When your eyes feel sore or tired, close your eyelids and cover them with a warm washcloth. Make sure to get enough shuteye, too. Your eyes replenish nutrients and relax as you sleep. Wear your glasses or contacts. Uncorrected vision problems put extra strain on your eyes. Some people wear different lenses when using a computer. Special lenses with different designs, powers, and tints can help your eyes adjust to screen use.